For almost half a century, movie fans have known that love means never having to say you’re sorry. But for Ali MacGraw and Ryan O’Neal, love underscores a near 50-year friendship. The iconic duo are currently in Baltimore to appear in a production of Love Letters. At 11:15 a.m. today, Mayor Stephanie Rawlings-Blake and Ron Legler – President of the Hippodrome Theatre – welcomed the stars to Charm City, where the Mayor proclaimed an official “Ali MacGraw and Ryan O’Neal Day” throughout town. Upon receiving the proclamation, O’Neal asked the mayor if this means they get a free meal? Running June 7 to 12, Love Letters is the romantic story of two young people from similar backgrounds who take very different paths in life over the course of their decades-long friendship. The pair rose to stardom in the 1970’s classic film “Love Story” and are now reuniting to perform in the national tour of Love Letters. 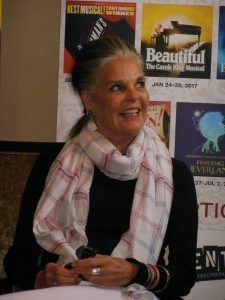 MacGraw described the play as, “Very funny, real and ultimately for me, very heartbreaking. “It’s a one act play, and we can’t look at each other. We’re working in a tiny area – a desk this size and two chairs. We’ve done it for quite a while now, so I think it’s safe to say we feel every bit of each other’s energies. Which is the fun of it, like a ping-pong game. “This is perfect play for us to do, and I think that audiences, whether they are aware of it or not – most of the people seeing it have seen Love Story – are reflecting secretly over the last 45 years of their own lives; their love affairs and breakups and what choice they did make and what choice they didn’t make. While this has nothing to do with Love Story – it just happens that the name suggests so – these are two people over a lifetime; not that brief time in their twenties that we played so many years ago. “There were no agent machinations, or ‘Who do I call?’. It was offered to us after the Broadway run, and they asked us both if we would be interested in doing the road company. Both of us said yes, but only if the other would agree to do it. 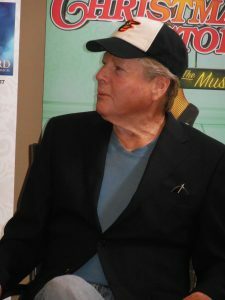 MacGraw initially demurred when this reporter asked if she and O’Neal would comment on their own true-life love stories and their corresponding feelings about love. (MacGraw was married to the late Steve McQueen; O’Neal was the long-time companion of Farrah Fawcett). “Well, then why do you still lock your door?” asked O’Neal. “It’s to keep the mystery,” replied MacGraw. Love Letters runs from June 7-12 at the Hippodrome Theatre. The theater is located at 12 North Eutaw Street, Baltimore Maryland. Tickets and other information may be found by visiting The Hippodrome online or by calling the box office at 410-837-7400. ← Larry Hogan’s report card: How would you grade him?